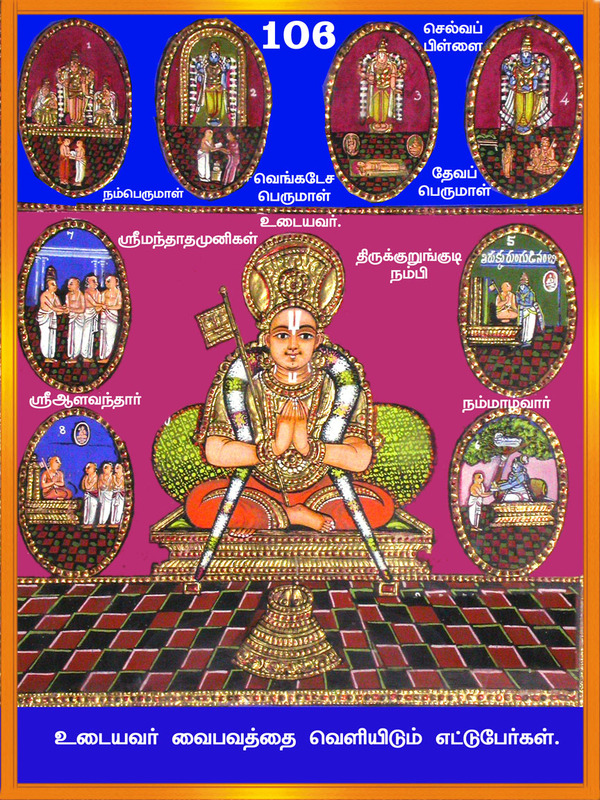 Through the previous two pAsurams, amudhanAr thought about how people go through sorrows of births whereas they could get saved with little bit of inclination, and about how emperumAnAr cultivated help to uplift them; in this pAsuram – amudhanAr thinks about how when there is no reason known to himself emperumAnAr has accepted him, and about how emperumAnAr is making divine presence in his inner and outer faculties (eyes, etc., and mind), and becomes happy, and asks emperumAnAr what may be the reason for such presence. By previous two pAsurams – amudhanAr censured the ones of unfortunate birth that did not surrender to emperumAnAr, and talked about how emperumAnAr changed the ignorant mind of those who were lost due to bad advises of those who did not have proper knowledge who followed the discardable path (of other philosophies), and how emperumAnAr advised that the apt lord for everyone is the Husband of lakshmI, and that such emperumAnAr is most virtuous. In this pAsuram – Looking at the divine face of emperumAnAr (amudhanAr says) – till date I have not known of my doing any good deed; also, I have not attempted to listen to any uplifting deep inner meanings; whereas this is my manner, your highness who possesses excellence of qualities which cannot be counted even by experts of true SAsthrams, had shown inaction till date and now/today your highness have come near me and are the focus of my internal and external eyes (mind and eyes); your highness! only you may please explain the reason. keerththi irAmAnusA – Oh emperumAnAr having many glories! semmai – beautiful / pure; by this it refers to not expecting other benefits (ananya prayOjanam). puNNiya nOnbu purindhum ilEn – puNyam is – Specific acts/karmas, which would be the reason for happiness in here [samsAram] as well as in there [paramapadham], that is based on SAsthram and varNASramam. I did not perform any such acts. purindhu – doing. It is said too, in ‘nORRa nOnbilEn [thiruvAimozi – 5.7.1]’ (I do not have any performance of karma yOgam (related to actions)), and ‘na dharma nishtOsmi [sthOthra rathnam – 22]’ (I am not firm on karma yOgam). That is, your highness had gone eighteen times to thirukkOttiyUr nambi and begged to learn the most important meaning that is of charama SlOkam; I did not do anything like that. It is similar to ‘nuN aRivilEn [thiruvAimozhi – 5.7.1]’ (I do not have subtle/deep knowledge that is of gyAna yOgam), and, ‘na chAthmavEdhi [sthOthra rathnam – 22]’ (I do not have Athma gyAnam (knowledge) too). irAmAnusA – Oh emperumAnAr (you having such glory)! en kaNNuLLum nenjuLLum ninRa ik kAraNam katturaiyE – As said in ‘nithrA pramAdha kalusheekrutha mAnasasya thathrApi SakthirihamEna’, even though I had been under your sight, due to the blemish not being amicable I had been like an independent monarch, (now) you are present as the matter of focus in my eyes and mind – your yourself please explain reason for such presence now. katturai – please explain; katturai is a full word. semmai nUl pulavarkku eNNarum keerththi – these learned ones do not wish for anything other than the divine feet of emperumAnAr; so they would be always focusing on the qualities/glories of ermperumAnAr; even for them it is hard to count all of emperumAnAr’s greatness. It is not possible to say that you accepted me because of not having anybody else; there are so many of these learned people under your divine feet; so there is no reason for taking me up. inRu pukundhu – I did not invite him or looked forward for him; without asking me, looking for an apt time, he entered by himself and took me up. en kaNNuLLum … katturai – He entered, and never went out. He got himself a place inside. His image is always present in my eyes. It is because he is well set in my mind. The thought here is that there is no reason other than your voluntary mercy. This entry was posted in iyaRpA, rAmAnusa nURRanthAdhi and tagged amudhanar, emperumanar, nonbilen, norra, nurrandhadhi, nurranthadhi, nutrandhadhi, nutranthadhi, ramanujar, ramanusa on April 1, 2017 by raghuram.